December 8, 2011 By Paul Mayer & filed under Buying Advice, Product Review. Low vibration. Bosch incorporated a sophisticated shock absorber system into this unit which is one of its defining characteristics. So, in addition to riding on ball bearings that smooth out the ride quite a bit, this unit also incorporates a series of pads that reduces the vibration to a level where it is barely noticeable. When I first fired up the unit and put it in contact with wood, I could hardly believe how smooth it was, both in initial startup as well as ongoing operation. Truly remarkable engineering feat. I sanded for a half hour or so using various grits with both the 5″ and 6″ pad and was not fatigued in the least. Let the tool do the work! My dad always gives me this advice and I rarely listen because I never feel like my tools work hard enough or fast enough. But this one does! I gave it a “1 finger test”, and sanded this entire board by making two passes, all the while operating the sander with a single finger. It was actually quite easy, and seemed to perform the work as effectively and as when I had the two handed “death grip” on the tool. Large cushy front handle. If you want to have better control over your sander than a single finger provides, there is a comfortable front handle with rubber grip which further reduces the vibration transferred to your body. 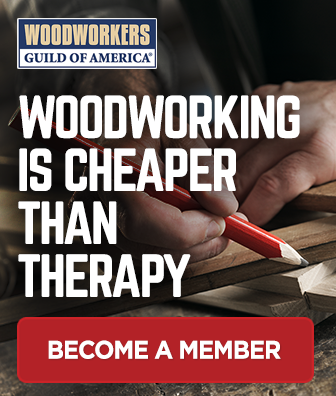 The additional control is nice to have, particularly when sanding with coarse grits which tend to bite into the wood a bit more and require more control over the sander, or when using the sanding on a vertical surface. Sure-fire trigger. The trigger feels solid, engages smoothly, and locks solidly in place for longer sanding runs. You know you have a premium tool in your hand when you engage this button. 5″ and 6″ pads. If you can’t decide between buying a 5″ or a 6″ ROS, this tool if perfect, as it ships with interchangeable pads. This is cool, as it is nice to have both. Don’t think of the difference as being one inch, but rather as 44% more surface area, or roughly 8-1/2 square inches of additional sand paper working for you. In practice, the difference is significant. I like using the 6″ pad as the default for large surfaces, and switch to the 5″ pad for getting into tighter places. Easy pad swap. The pads can be swapped by removing a single 5mm hex screw. power! Power! POWER!Â Like most woodworkers I don’t particularly enjoy sanding, so my perfect sander lets me get the job done quickly and effectively so I can get the sanding behind me and get back to the parts of woodworking that enjoy more. I also tend to use a ROS in situations where most woodworkers might choose a belt sander.As an example, if I have done a good job on a panel glue-up, and the seams are barely noticeable, I will go straight to the ROS to flatten and finish sand the panel. To do this, you need a ROS with some “gitty-up”, and this one has it. With 3.3 -amps of power, this tool powers through wood at an impressive clip, even with the 6″ pad using a coarse grit paper. Given the power and weight of the tool, I don’t expect to use it on vertical surfaces, but for horizontal sanding this bad boy gets the task done in short order. Respectable onboard dust collection. The onboard dust collection engages solidly to the unit, and is easy to remove and reinstall. It also performs well, removing a good portion of the dust as it sands. Cartridge filter. One of the reasons behind the effectiveness of the dust collection is that there is a high quality pleated paper filter enclosed in the dust canister. This helps to capture a lot more of the fine dust that is generated during operation. It is also simple to remove, clean and replace. Shop vacuum hookup. If you prefer to hook the sander up to a shop vacuum, it includes a nice adapter for connecting to either a 1-1/4″ or 1-1/2″ hose. It holds it solidly in place while sanding so that I don’t need to use duct tape as I have had to do with other units. Variable speed. I normally operate a ROS in full speed mode, but occasionally want to dial back the speed a bit. 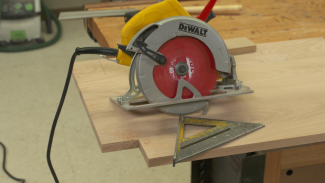 One situation where this feature comes in handy is when you are flush sanding edge banding on a shelf to a veneer-covered plywood. 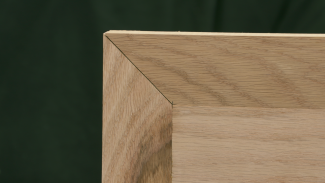 If you go too fast here, you can easily sand through the veneer which makes for an ugly shelf. 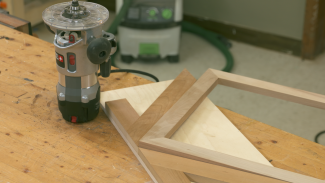 This feature lets you slow down and sneak up on the veneer more easily. Solid where it counts. By removing the pad you can see the drive gear and other components are made of machined metal, and everything “under the hood” is high quality. While it’s nearly impossible to test longevity, I don’t think you’re likely to wear this tool out. Finish quality:Where the rubber hits the road. The swirl free finish that this thing delivers is superb. It is impossible to capture finish quality in a small photograph, but after sanding to only 150-grit, I applied a dark stain which is a great litmus test of sanding quality, and still could not see evidence of machine marks with a naked eye. – Price point. At a retail price point of $299 it may prove difficult to justify for the average hobbyist, but honestly I don’t expect to find this level of quality and performance at a cheaper price point. For those who have significant sanding requirements, I believe that this tool is a reasonable value for the level of quality and innovation that it delivers. If you want to save some dough, you can buy the sander with either a 5″ or 6″ pad (not both) for about $229. – Pad change requires a tool. Granted it is just a nit because the process about as simple as it gets with only a single hex screw required, but I would think Bosch could come up with a way to lock the pad in without requiring an external tool. The bottom line is that this is one awesome sander. The ROS65VC brings a new level of innovation to the ROS market, and promises to delight anyone who decides to own one. The tool is also available in models that include either a 5″ or a 6″ pad (not both) for a list price of $229. For these options, look for models ROS65VC-5 for the unit with a 5″ pad, or ROS65VC-6 for the 6″ pad. $300.00 is too much for even us who work with them every day. I have several of different size (5″ & 6″). It is easy to plug in both and use without the change of the pad. Where is the advantage? I’m not sold. At $300, you might as well go with Festool. Great review and a great tool. Enough info to make an informed decision. I’ll likely buy one of these in the next few months. I thank you for such a thorough review. Based on the review I purchased this tool. First, I agree with your comments and insights completely. I work in my basement and have great concerns regarding dust collection. Even without attatching to my dust collector, just the on board filter results in extrordinary dust control. Vibration control is a major improvement over my 20 year old bosh ROS. Additionally, this sander is more aggressive, yet leaves a much superior surface. With the improved dust collection, the sanding pads seem to last longer too. Besides the health benefits, all of this makes sanding much more grstifying. Yes I concur that $300 is a lot to spend on a sander (I actually purchased it for $230 from a very reputable source on a 15% sale off their regular price of $279 for the kit which includes both 5 & 6 inch pads and a nifty carrying case), but health issuses related to dust and vibration are real and this sander is a leap above other ROS sanders (even those pretty green and black ones), I believe it is money well spent. Thanks for taking the time to share your experience with the tool, and I am glad you found such a great deal on it. Forget about Bosch, Festool is the best random orbit sander you can possible have in your arsenal!